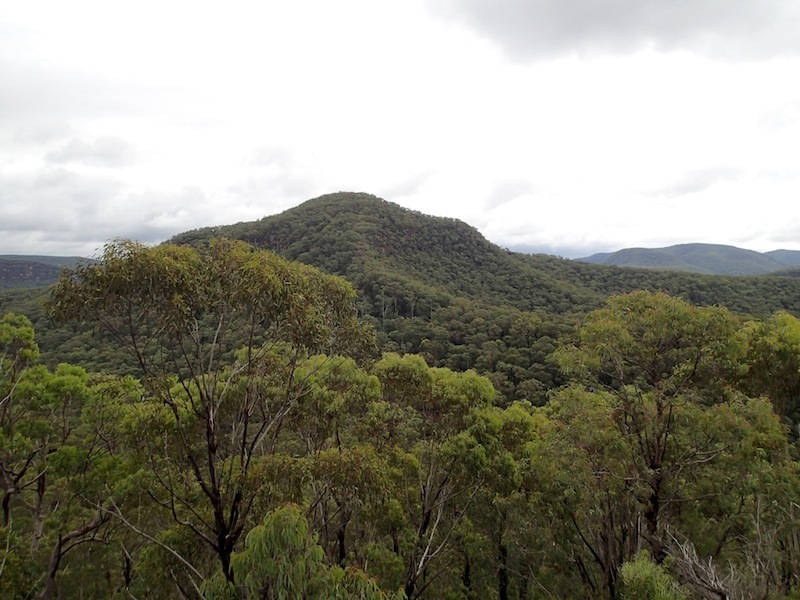 My first trip with the Sydney University Bushwalkers (SUBW) was an overnight amble to and from the Colo River. It was a 6km on-track bushwalk and thus it provided scant chance to appreciate the remoteness and the roughness of the surrounding country. Still, as I gazed up at the towering cliffs that fringed the inky black of the Colo, I was transfixed, mesmerised by the absolute stillness of the water and the sharpness of the rock, and how the two contrasted so perfectly. Now, almost four years later, I journeyed back into the country with my good friend Tim, a bushwalker not unfamiliar with the ways of the Wollemi National Park. We met at Windsor station at 8.30am. The clouds above were heavy, grey and looming, and the light pitter-patter of rain on cement accompanied us as we made for the car. The drive was brief. Forty minutes up Putty Road, pulling off the main drag a few kilometers past Colo Heights to reach the trail-head. Then, the engine was off, laces tightened, and we were ready to head into the Wollemi wilds. Our packs were light. Food, first aid, water. Perhaps also a raincoat in case the wind picked up and started biting at bare skin. Shortly after 9am we were bashing along the firetrail. We made quick time, Tim’s new trail runners experiencing optimum conditions on the rough, uneven road and my own providing rare comfort compared to the tight, unpadded canyoning shoes I often found myself walking in. Despite the light, discontinuous rainfall, we quickly became soaked with water as we brushed against the many herbs and shrubs that speckled our path. However, our fast pace ensured that we remained warm. Twelve kilometers later, the track ended. We experienced a brief moment of confusion as we consulted the map and discovered that, as often can be the case, the firetrail was incorrectly marked. Back-tracking half a kilometer to a high point, we plunged into the bush and headed due west. We followed an obvious ridge through scrub until the contour lines bunched up at the far west end. We then descended off the northwest side, finding a pass, which included a few scrambles down grimy rock. It very quickly became apparent that Tim’s new shoes were not well suited to climbing on wet rock. In fact, even my sticky walking boots were having problems on the slimy, hard surfaces. None-the-less, we made it to the creek junction at the base of the descent, and followed the blue line north to reach Clews Cave for lunch. Major Clews, after whom the cave was named, was a surveyor who waged many an unsuccessful battle with the country west of the Colo River, or the ‘bad bit across the river’ as he called it. Still, considering the tools he had at his disposal, the heavy packs, limited food supplies and no access to emergency services if something went wrong, his travels into the Wollemi were nothing short of inspiring. I was therefore rather baffled as to why such an unimpressive cave acquired his name (or was in fact was named at all). But it did provide us shelter from the rain, and after a quick lunch and an odd discovery in the form of a small note placed under a rock (which had the approximate words: “keep our wilderness pristine, carry all rubbish out. Burn this paper after reading.”), we headed west to climb the Island. After navigating around some rather painful looking lawyer vine, we mounted the ridge-top that ran southwest towards the Island. Following this was simple, until we reached the cliff line and the slippery rocks became a problem once more. The greatest challenge was a two-move climb up a slightly exposed rock face. There was an excellent looking foothold, but in the wet it might as well not have been there. Tim’s shoes really failed at this point and a hand was required to prevent him from slipping down onto the treacherous rocks below. After a bit more scrambling, we reached the summit of the Island and admired spectacular views over the junction of the Colo and Wollangambe Rivers. Those great cliffs were there as I remembered, but now I observed them with a slightly different light – looking keenly for potential passes (although I still experienced an awe at their grand beauty). The knowledge that we had 12km of firetrail and more than 5km of scrub to wage war with before dark meant that we didn’t waste any time getting off the Island. A pause was only allowed when dropping off the slippery climb and when hitting the patch of lawyer vine just above the creek. Crossing the creek, we headed up the ridge directly behind Clew’s cave. The pass we took was not technically difficult, but the scrub was quite thick. Once at the top, we headed northeast to a highpoint before turning south. We made a slight navigational error when we turned south too quickly and headed down a steep ridge but we soon recognised our mistake, retraced our steps, and reached the firetrail in daylight. The return walk was long and cold – our clothes were saturated and the temperature was dropping slowly but noticeably. The beauty of our surrounds, however, served as a pleasant distraction. A mist had crept in, shrouding vegetation so that distant trees appeared to sprout from clouds, and it dampened sound, which created a comfortable stillness alike to being under a blanket. We powered along to keep warm, but eventually had to stop for a quick food break as energy ran low. It was no surprise that stomachs were grumping, as a quick glance at the time showed it was nearing 9pm. We reached the car in darkness and, shivering, hastily changed into dry clothes. Due to the late hour, we made for an unsatisfying fast-food dinner, which, at least, enabled us to avoid leaving the comforting warmth of the car. All up, we covered an impressive 36km – 12km of which was off track. However, the area we explored provided only the smallest taste of what the Wollemi has on offer and I am, as I am sure Tim is, very hungry for more.